View More In Motor Oils. Aeroshell Oil W 15 W 50 is a premium semi-synthetic ash less dispersant oil specifically developed for aviation piston engines. 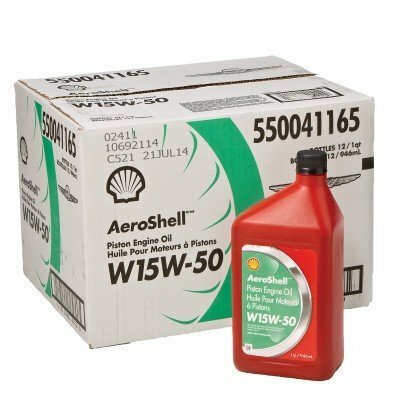 AeroShell Oil W 15 W 50 is a special blend of a high quality mineral oil and synthetic hydrocarbons with an advanced additive package that has been specifically formulated for applications. The combination of non-metallic anti-wear additives and selected high viscosity index mineral and synthetic base oils, give exceptional stability, dispersancy and anti-foaming performance. The advanced additive package in AeroShell W 15 W 50 provides excellent protection to engines operating at extreme ambient temperatures. The ash less anti-wear additive package provides exceptional wear protection for camshafts and lifters and other wearing surfaces. AeroShell W 15 W 50 has become very popular amongst engine manufacturers and operators alike. In order to cater for those Lycoming engines that need improved load carrying, the Lycoming LW 16702 anti-wear additive has been incorporated into the formulation thus eliminating the need for supplemental additive addition. If you have any questions about this product by AeroShell, contact us by completing and submitting the form below. If you are looking for a specif part number, please include it with your message.